Kit cars have a reputation of being shoddy impersonations of rare exotics. Cobras are the ones that seem to be most common, but remember those Camaro-based Ferrari knock-offs? So when we found this Bugatti Veyron kit car on eBay, we had more proof that what’s old is new again. However, the donor vehicle may be a surprise. So it’s obviously not a real Bugatti Veyron, but it sort of looks like one from the proper angle. Either way, it utilizes a 2004 Pontiac GTO chassis and drivetrain, which is good for 350 hp and 365 lb-ft of torque. That means this LS1-powered replica should be able to accelerate to 60 in roughly 5.3 seconds and hit a top speed of 160 mph – not quite Veyron material but, then again, what is? The asking price of $125,000 gives the new owner the ability to customize the fiberglass exterior, interior, and other accessories to anything his/her heart desires. As a real Veyron goes for over $1.3 million, this might be the closest the majority of us may get to ever owning one. To play Devil’s advocate, one could obtain a used high-end exotic for the same price. But perhaps there is a diehard General Motors fan who also has Bugatti and champagne dreams, so if that sounds like you, your car has arrived. 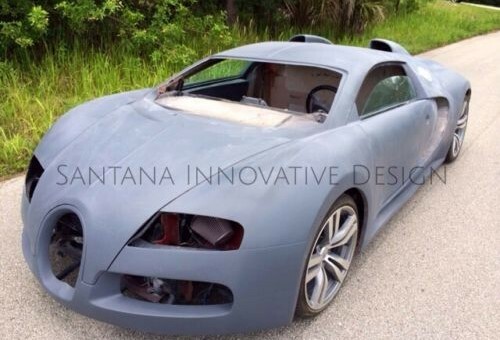 $125,000 for a cheap knock off of a Bugatti, with incomplete body work, no place to sit, and non-Bugatti performance. They ruined a perfectly good Monaro for THAT? Hello, to the author of this news tidbit. Your comment is incorrect” remember those Camaro-based Ferrari knock-offs? They were based on the Fiero and Ferrari pursued legal action against several companies. Most auto enthusiasts know it was the Fiero not the Camaro.